174 million monthly searches. That kind of traffic will quicken the entrepreneur’s and the investor’s heart, signaling two market conditions that scream opportunity: first, interest in a product; second, lack of the destination site to satisfy demand. Of course, it takes a bit of artistry to envision the solution. The world has grown obsessed with tattoos. Each month millions of people go online looking for tattoo designs, and so far they have been without a reliable marketplace to direct their gaze. Until Tattoodo. Tattoodo is a social marketplace for tattoo designs, a place where people can purchase tattoo designs from expert artists or crowdsource a custom design. Unless you’re already in the know, figuring out where to go for a tattoo design is an intimidating task – the artwork you plan to buy will go on display in the permanent collection after all. On your body! Choosing a design from among imperfect digital images or unknown artists is a horrible way to make such a personal investment. The crowdsourcing model makes perfect sense for this market. Tattoodo gives tattoo artists a global, highly visible marketplace for their work, as well as a creative outlet to craft singular designs. Buyers gain the peace of mind of selecting quality work from established, accomplished artists. Tattoodo also gives buyers the unique opportunity to see a dream design made real. The process for sourcing a custom tattoo is simple. You describe what you’re looking for and select the price that you’re willing to pay. Artists then submit their ideas. Shoppers have the opportunity to collaborate with artists to tweak designs and then purchase their favorite design. Though the rise in popularity of tattoos has multiplied the number of talented tattoo artists, not everyone has enjoyed access to the best in the business. Commissioning a drawing – participating in the drafting of the design – simply hasn’t been a feasible option for most before Tattoodo. Tattoodo co-founders Johan Plenge and Mik Thobo-Carlsen teamed up with Ami James, TV personality and famed owner of the Miami parlor Love Hate Tattoos, when they realized that most of the design images available through online searches were “garbage.” A natural partnership has since evolved between Tattoodo and Threadless, a community and marketplace for custom-designed T-shirts and more. 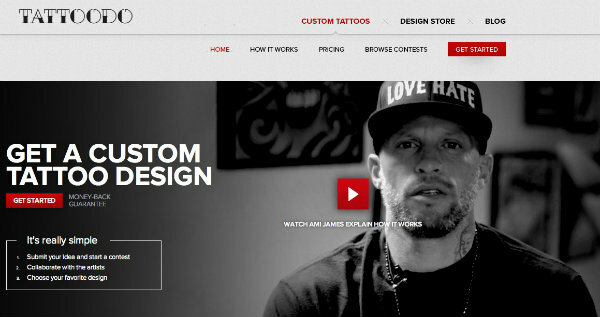 The startup has been hard at work, according to Ami, to “create a database for quality designs from the best tattoo artists…,” to become the #1 online marketplace for tattoos. Tattoodo racked up 100K Facebook fans and tripled their traffic in their first 7 weeks after launching. The flourishing community also gives buyers the chance to try out a sticker of a design before getting a tattoo, and recommends local artists for having work done. View more designs offered by Tattoodo on Facebook, Twitter, Pinterest and Instagram.